Download "Fixed Term Deposit account Terms & Conditions"
1 Fixed Term Deposit account Terms & Conditions Please read and keep your Fixed Term Deposit account terms and conditions (conditions) in a safe place. These conditions, together with the application form and our account charges leaflet, form the agreement between you, the account holder, and us, The Co-operative Bank p.l.c. Altogether, they set out the features of the Fixed Term Deposit account, they tell you how your Fixed Term Deposit account works and what your and our responsibilities are once you open a Fixed Term Deposit account with us. We, us or our means The Co-operative Bank p.l.c., P.O. Box 101, 1 Balloon Street, Manchester M60 4EP. You can contact us on or by writing to Customer Services Manager, The Co-operative Bank p.l.c., Delf House, Skelmersdale WN8 6GH. Where there is reference in these conditions to a business day, that means any day other than Saturday, Sunday or a Bank Holiday in England and Wales. Where there is reference in these conditions to unique identifier, that means the required information to identify a bank account. 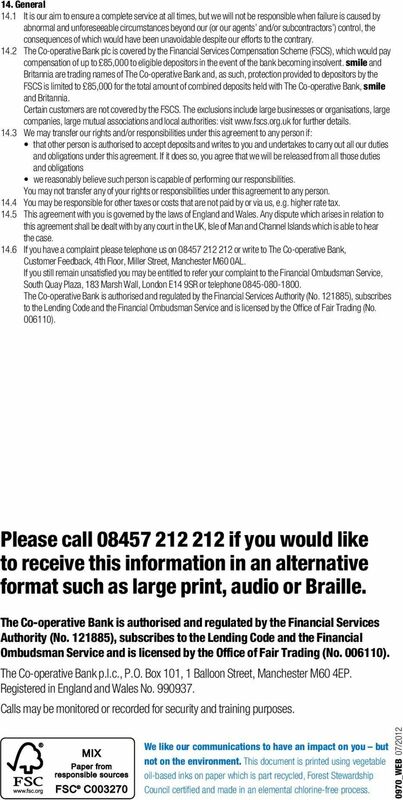 For accounts in the United Kingdom this is the account number and sort code. If you ask us at any time during the life of this agreement we will provide you with the information contained in this agreement. Where there is reference in these conditions to close of business, details can be found from any Co-operative Bank branch or via telephone banking. As required by law, please note any terms and conditions of your account and all information, statements and notifications will be in English and we will communicate with you in English. The Co-operative Bank p.l.c. is authorised and regulated by the Financial Services Authority (No ). 1. Your Account 1.1 To open an account you must be a UK resident aged 16 or over. 1.2 The currency of the account will be Sterling and the deposit you make into your account must be: in Sterling, or a recognised UK bank cheque, or a Co-operative Bank account transfer. 1.3 We will only accept one deposit from you into your account although you may be able to open more than one account at a time. 1.4 The account is for a fixed period of time and will start on the day the account is opened as confirmed by us in writing. 1.5 The account will run for the period selected by you on your application form and you cannot withdraw your money for the term of your account. 1.6 The minimum and maximum deposit you must pay into your account will depend upon the period selected by you on your application form and is as follows: for six months you need to pay into your account at least 5,000 and not more than 1,000,000 for 1, 2 or 3 years you need to pay into your account at least 1,000 and not more than 1, We are obliged to confirm the true identity of all applicants and reserve the right to decline an application to open an account from you or any deposit. 1.8 You may not overdraw or borrow on your account and you can only use your account as a personal account. You must not use it as a club, charity, sole trader, company, partnership or other kind of business account or for any business purposes. 1.9 You can allow another person to deal with your account. If you want to do this we will require you to sign a document called a third-party mandate permitting such person to deal with your account. You can also appoint an attorney under a power of attorney. This legal document allows another person to act for you when you are not able to. If you allow another person to deal with your account they must do so in accordance with these conditions and you will be responsible for their actions or omissions as if they were your own You may open a joint account and all joint account holders must comply with these conditions. Joint account holders will each be fully responsible for all actions and omissions relating to the account. 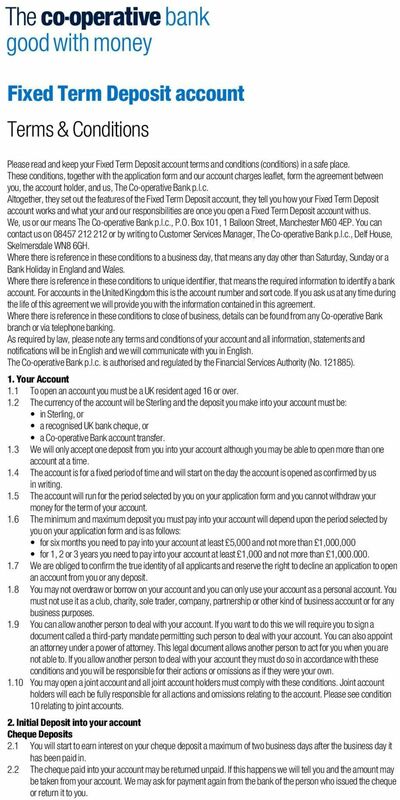 Please see condition 10 relating to joint accounts. 2. Initial Deposit into your account Cheque Deposits 2.1 You will start to earn interest on your cheque deposit a maximum of two business days after the business day it has been paid in. 2.2 The cheque paid into your account may be returned unpaid. If this happens we will tell you and the amount may be taken from your account. We may ask for payment again from the bank of the person who issued the cheque or return it to you. 2 You can assume that at the end of six business days, the cheque is cleared. After this time you are protected from any loss if the cheque is subsequently returned unpaid, unless it is found to be fraudulent or you are a knowing party to fraud. 2.3 When you pay your cheque into your account if you then cancel your account in accordance with condition 11.3 you will have to wait a maximum of four business days after the business day it has been paid in before we can return your deposit. Electronic Deposit 2.4 We accept funds transfers from another Co-operative Bank account. 2.5 The payment(s) will be credited to your account immediately after we receive them provided they are received by us before the close of business, otherwise they will be dealt with the next business day. 2.6 If a payment is fraudulently or mistakenly paid into your account, the amount of the payment may subsequently be removed from your account. This may be the case even if you have used all or part of the money. 3. Maturity 3.1 We will write and tell you up to 30 days before your account reaches the end of its term to tell you the date your account will mature and what options are available to you. 3.2 At the end of the fixed term your account is automatically converted to a Co-operative Bank instant access savings account in your name. The terms and conditions for this account will be provided to you when we write to you as explained in Your account details will remain the same and you will be able to access your account on the first business day following maturity. 3.4 You can access the account through telephone banking on You may need to answer some simple security questions. 3.5 If you want the funds to be transferred to a third party at the end of the term then you will need to contact prior to maturity. 4. Unauthorised or Incorrectly Executed Payments 4.1 You must tell us without undue delay and in any event within 13 months after the date the transaction was taken from your account, on becoming aware of any unauthorised or incorrectly executed payments by telephoning us on Security 5.1 You must take all reasonable security precautions to prevent misuse of your account and your customer security details (this can include account details, and other security details which can include security codes, passwords or secure personal information which allow you to access your account, including telephone banking). Failure to take reasonable security precautions may result in access to your account, or additional services such as telephone banking, being blocked. Reasonable security precautions can include: not disclosing your security details except when registering or resetting your security details to use telephone banking never disclosing or writing down your security details in any way that can be understood by someone else, including a joint account holder not choosing security details which may be easy to guess ensuring no one hears or sees you when you are using your security details, keeping statements safe and destroying them safely, e.g. by shredding complying with all reasonable instructions we issue regarding keeping your security details safe telling us as soon as possible of a change of name, address or other contact details so that correspondence does not get into the wrong hands. 5.2 If your security details are lost or stolen or you think someone knows them or has used or tried to use them, you must tell us immediately you are aware by telephoning us on We will ask you to co-operate with us by providing information or other assistance in connection with the loss or misuse of your security details. We may also give the police information about you or your account which we consider relevant to assist with any investigation of criminal activity. In some instances we may ask you to contact the police in connection with suspicious or criminal activity on your account. 6. Liability 6.1 The maximum you will have to pay us if your security details are used without your permission is 50. If they are used with your permission or as a result of your acting fraudulently or without reasonable security precautions (see condition 5), or if you have deliberately or with gross negligence failed to inform us without undue delay of the loss, theft, misuse or suspected misuse of any of your personal security details, you may have to repay all losses. 6.2 You will not be responsible for any losses for use of your secure personal information after you have informed us in the manner set out in condition 5.2 of their loss, theft, misuse or suspected misuse. 6.3 We are responsible to you for the correct execution of your payment instructions unless we can show that the recipient bank did receive the funds. On your request we will make immediate efforts to trace the funds and tell you of the outcome. If we have made an error we will without undue delay restore your account to the state it would have been had the error not taken place. 6.4 Provided you have notified us as required by condition 4.1 and we cannot show that the payment transaction was authorised, we will immediately refund the amount of the payment transaction to you and, if applicable, restore the account to the state it would have been in had the unauthorised payment transaction not taken place. 5 to any person we will or intend to transfer our rights or obligations. We may disclose your information to licensed credit reference and/or fraud prevention agencies to help make financial or insurance proposals and claims decisions (this will be during the application process and on an ongoing basis, to decide whether to continue to make products or services available to you or adjust any level of credit) for you and anyone with whom you are linked financially or other members of your household our enquiries or searches may be recorded and credit reference agencies may supply us with financial information.if you make several credit applications within a short time, this may temporarily affect your ability to get credit. We may also disclose information to licensed credit reference agencies about how you conduct your account(s) and this information may be shared with other financial institutions to help make financial decisions about you and anyone with whom you are linked financially or other members of your household. If you borrow and do not repay in full and on time, we may tell credit reference agencies who will record the outstanding debt. A link between joint applicants and/or any individual identified as your financial partner will be created at credit reference agencies, which will link your financial records. You and anyone else with whom you have a financial link understand that each other s information will be taken into account in all future applications by either or both of you. This linking will continue until one of you successfully files a disassociation at the credit reference agencies. You agree that your information may be transmitted to, from and/or through any country as a result of your use of your account(s) and any services which form part of your account(s) irrespective of the levels of data protection provided in any particular country and at your own risk. If we transfer your information to an agent or subcontractor who provides a service to us in another country outside the European Economic Area, we will ensure they agree to treat your information with the same level of protection as us. If you write to us and pay a fee you have the right of access to your information held by us. Write to us at Customer Care, The Co-operative Bank p.l.c, P.O. Box 101, 1 Balloon Street, Manchester M60 4EP. You have a right of access to your information held by credit reference and fraud prevention agencies on payment of a fee. If you ask we will tell you the name and address of the credit reference and fraud prevention agencies we may use. We and other organisations may access and use from other countries the information recorded by fraud prevention agencies. Law enforcement agencies may access and use this information. We may record and/or monitor telephone calls to enhance security, sort out complaints, improve our customer service and for staff training purposes. 13. Changes Changes to our service or these conditions 13.1 We may make changes to the services or conditions of this account and we may introduce new services or conditions. Changes may be to the services or these conditions for the following reasons: to make these conditions easier to understand or fairer to you to correct mistakes, ambiguities, inaccuracies or omissions where it is reasonable to do so or as a result of customer feedback to make improvements to the services we provide which are of benefit to you to reflect changes in security design or technology at no increased cost to you to respond to changes in the law, codes of practice, industry-wide fraud prevention practices, court or ombudsman decisions or new regulatory requirements or practice to respond to changes in the general retail practices of banks and other organisations offering similar services including the terms on which they offer similar products to take account of any change in our ownership or to reflect a reorganisation of our business as a result of it being acquired or merging with another bank or organisation to make sure that our customers and the customers of the other organisation are treated in a similar way if they have a similar product if we reasonably believe the change is necessary in the interests of our business as a whole, for example to protect our financial strength to respond to changes in your credit assessment or where your account has not been used for 12 months. If we make changes to our services or conditions for the reasons listed above: where the change is more favourable to you we will tell you of any change at the earliest opportunity after the change has been made in national press advertisements, statement messages or statement inserts, or by writing to you (this can include ). The change will apply to your account automatically from the date of the change where the change we make is not favourable to you we will tell you of any change by personal notice at least 30 days before we make the change. The new service or conditions will apply to your account automatically. However, if you do not agree to such a change you can, at any time up to 30 days from the date we tell you of the change switch your account or close it without paying any extra charges or interest. If you do not switch or close your account you will be deemed to have accepted the change. Remember you can close your account at any time if you want (see condition 11) Where we make a change for one or more of the reasons in conditions 13.1 we will do so in a reasonable and proportionate manner If we make a number of changes or a major change to these conditions during any 12-month period, we will provide you with a summary of the changes and let you know where you can obtain an updated copy. GE Capital Direct GE Capital Direct Savings accounts General Terms and Conditions If you applied for an account with us before 20 November 2014, these terms and conditions take effect on 20 January 2015. Basic cash account. This document can be made available in Braille, large print or audio upon request. Please ask any member of staff for details. Fixed Rate ISA terms and conditions. Bank, we, us, our means Secure Trust Bank PLC as provider of the Account services.